UFC president Dana White says it all the time, “Don’t leave it in the hands of the judges.” Why? Because it could be a crap shoot if that final horn sounds. Now-former UFC welterweight champion Johny Hendricks learned the hard way Saturday night in his rematch with Robbie Lawler. It appeared as though Hendricks was in control for much of their five-round affair, but when the judges rendered their decision, it was Lawler who was awarded a controversial (48-47, 47-48, 49-46) split decision victory. Now, how did Sal D’Amato, Glenn Trowbridge and Marcos Rosales come to their respective conclusions? Every round was scored 10-9 by each judge. D’Amato had Hendricks winning 48-47. He had Lawler taking just the first and last periods. 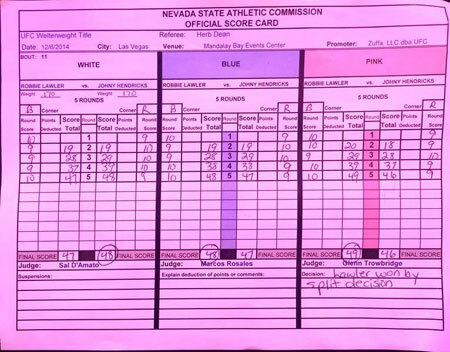 Trowbridge and Rosales agreed that Lawler took the bookend frames, but their scores differed in between. Trowbridge thought Lawler won every round but the middle one for a 49-46 tally. Rosales gave Hendricks the second and third stanzas for a 48-47 score. And there you have it. Aaaaaaand neeeew! Despite the controversy, Hendricks took the loss like a true champ. UFC 181 took place inside Mandalay Bay Events Center in Las Vegas, Nevada.